Impairments in the interaction between the central nervous system and the endocrine system can lead to a number of disorders in children. These include type 1 diabetes, growth disorders, adrenal thyroid and pituitary problems, Addison’s disease and Cushing syndrome, among others. 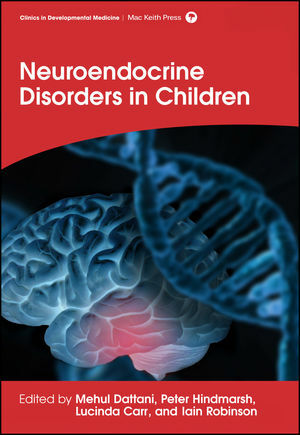 Neuroendocrine Disorders in Children provides a comprehensive examination of paediatric and adolescent disorders focusing on the basic science and its clinical relevance. Complex issues are discussed in an easy-to-follow manner and the latest developments in the area are reviewed. This volume will become invaluable reading for paediatric endocrinologists, paediatric and adult neurologists and trainee paediatricians. Professor Mehul Dattani MBBS, DCH, FRCPCH, MD leads paediatric and adolescent endocrinology at Great Ormond Street Hospital for Children, London. His research interests are in the area of growth, pituitary development and disorders of puberty. Professor Dattani has received a number of national and international awards for his research work. He is currently Chair of the Programme Organizing Committee of the European Society for Paediatric Endocrinology. Professor Peter Hindmarsh BSc, MD, FRCP, FRCPCH is Professor of Paediatric Endocrinology at University College London and Divisional Clinical Director at the University College London Hospitals. His research interests include mathematical modelling of feedback systems including growth hormone, cortisol and insulin. He served as Chair of the working party on diabetes whose work led to major improvements in paediatric diabetes care in the UK. Professor Iain Robinson MBE, MA, DPhil, FMedSci, HonFBPhS was head of the Division of Molecular Neuroendocrinology at the Medical Research Council National Institute for Medical Research until retirement in 2009. A major focus of interest was the study of hypothalmo-pituitary defects that cause growth retardation in children. His is group pioneered microsampling techniques in experimental animals and neonates, as well as developing novel transgenic and imaging techniques. Dr Lucinda Carr MB, ChB, FRCPCH, MD is Consultant Paediatric Neurologist at Great Ormond Street Hospital for Children, London, working across the departments of neurology and neurodisability. She served as the clinical lead in neurology at the hospital from 2008 to 2013. Dr Carr's main research interest is in movement disorders and cerebral palsy and she was a member of the team that developed the NICE guidelines on the management of spasticity in children.